Packet Radio is enjoying an upsurge in our area, largely as a result of people seeing its value as an efficient means of communicating in emergency situations. But it sure isn’t limited to emergencies! While the traditional method of using a computer, a TNC (terminal node controller) and a radio is the easiest, with modern computers and good soundcards, you can eliminate the expense of the TNC. Check out our Packet Intro Pages! 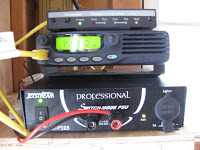 To learn more about packet radio and digital modes, please contact Bryan Weaver VA3OG. Note: If greyed out, current status is unknown. Public BBS’s in the GTA West. Note: Greyed out means status is unknown at present.